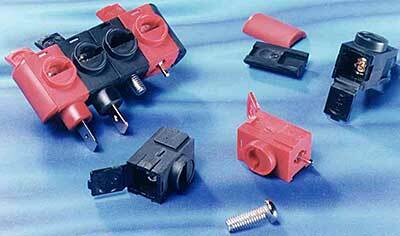 Cliff™ modular contractor® terminal blocks are primarily intended for use in permanent installation situations. They are designed as a superior alternative to old style screw terminal barrier strips. 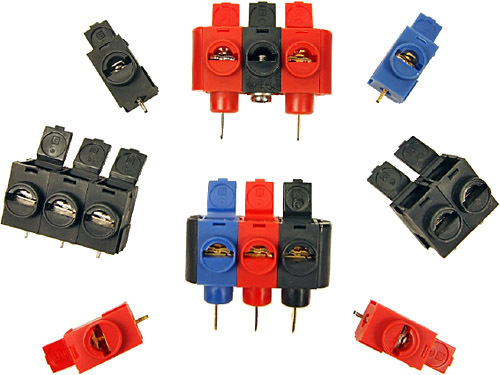 They can be used in power supplies, amplifiers, car equipment, shower controls and various touch-proof and tamper-proof electrical and electronic equipment. See the PDF data sheet: Modular Contractor® Terminal Blocks (opens in a new window). Modular construction allows for easy fabrication of multiple unit assemblies. 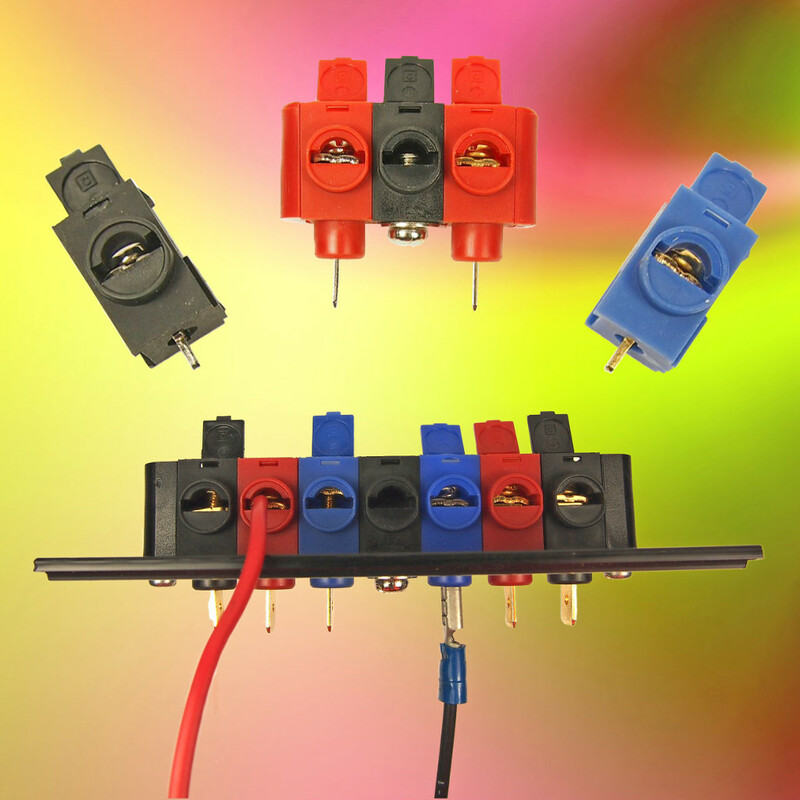 Coloured Colored terminals available for easy identification in red, blue and black. Accepts wires from 26 AWG to 12 AWG and ¼″ fork spade connectors. Clamping medium is a combi screw with a slotted cross head which clamps on to a captive profile washer. 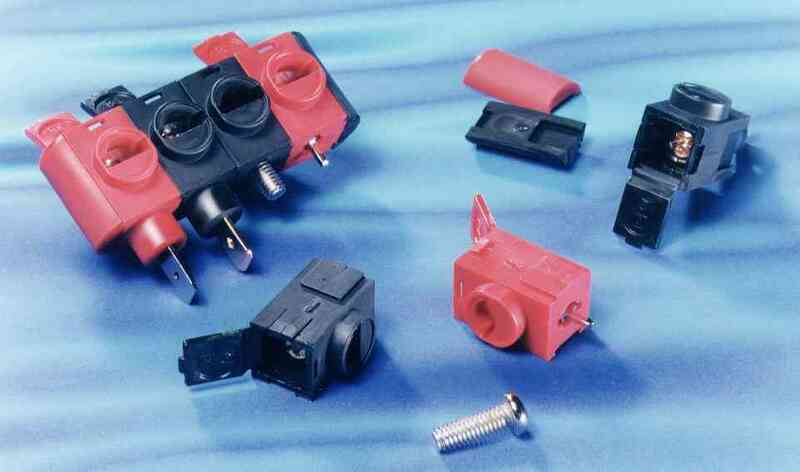 Chassis (¼″ Faston) or PCB mounting versions. Approvals UL94HB, EN60065 (complies) and CSA C22.2. Screw fixing module available which can be positioned anywhere in a multiple assembly to allow it to be screwed to a PCB or chassis. End terminations available to finish the ends cleanly and give sufficient creepage clearance for the end terminals to meet UL norms. It is possible to write on the lid cover with a suitable pen. For OEM users our factory can hot print custom legends onto the lid or front face. Rated (maximum): 30 A (PCB version tested by wire attached to PCB pin and not in a PCB). Contact Resistance: nickel < 30mΩ; gold < 20 mΩ. Dielectric Withstand (contact to chassis): > 2.5 KV AC 50Hz for 1 minute. Temperature Range: -20 °C to +80 °C. Maximum screw tightening torque: 0.8 Nm. Supplied in packs of 100 pieces with lids open. Screw fixing unit supplied in packs of 100 pieces with screws separate. Ends supplied in bags of 100 sets. FCR 7900 Faston, black, nickel. FCR 7900G Faston, black, gold. FCR 79001 Faston, red, nickel. FCR 79001G Faston, red, gold. FCR 79002 Faston, blue, nickel. FCR 79002G Faston, blue, gold. FCR 7901 PC-type, black, nickel. FCR 7901G PC-type, black, gold. FCR 79011 PC-type, red, nickel. FCR 79011G PC-type, red, gold. FCR 79012 PC-type, blue, nickel. FCR 79012G PC-type, blue, gold. FCR 7902 Screw-mount M4, black. FCR 7903 End plates (pair), black. FCR 79031 End plates (pair), red. UK Registered Design 2066438, USA Patent 405055. Please also see our other terminals.